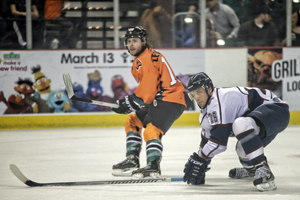 MOLINE, Ill— The slide continues for the Tulsa Oilers. The last time the Tulsa Oilers won a game was back on January 11th when they handed the Brampton Beast a 7-2 loss. They have not won a single game since then. The Oilers traveled to Moline, Illinois on Friday night to take on the Quad City Mallards, a team they last faced at home on December 20th and won 5-2. After a scoreless first period, Tulsa took advantage of the game’s first power play early in the middle frame. A stretch pass from Ryan Menei connected with Adam Pleskach and the Oilers rookie moved in all alone on Mallards’ goalie Thomas Heemskerk. Pleskach pulled the puck to his forehand and roofed the shot to give the Oilers a 1-0 edge just 1:47 into the second period. The goal pushed Pleskach into the team lead with 25 tallies this season and Tulsa maintained the lead throughout the remainder of the period. Brad Fogal got the start in net for Tulsa for only the second time since joining the Oilers back on January 10th. He made a string of spectacular stops but was finally beaten by a Jeff Lee wrist shot at the 2:37 mark of the third period. Lee’s 13th goal of the season knotted the contest at 1-1. Fogal remained in top form until Vladimir Nikiforov’s snapper from the wing found its way into the net with less than five minutes remaining in regulation. Despite a frantic effort from the Oilers to find the equalizer, Heemskerk shut the door and preserved the precious two points for Quad City. Tulsa falls to 19-22-3 and have lost five straight in Moline dating back to last season. Fogal falls to 0-2-0 on the year as an Oiler while Heemskerk, who just returned from his AHL call-up to the Worcester Sharks and stopped 27 of the 28 Tulsa shots , improved to 10-1-4 between the pipes for the Mallards. The Oilers return home on Saturday night to face the Denver Cutthroats for the first time this season in the BOK Center. This entry was posted in Sports on February 1, 2014 by admin.